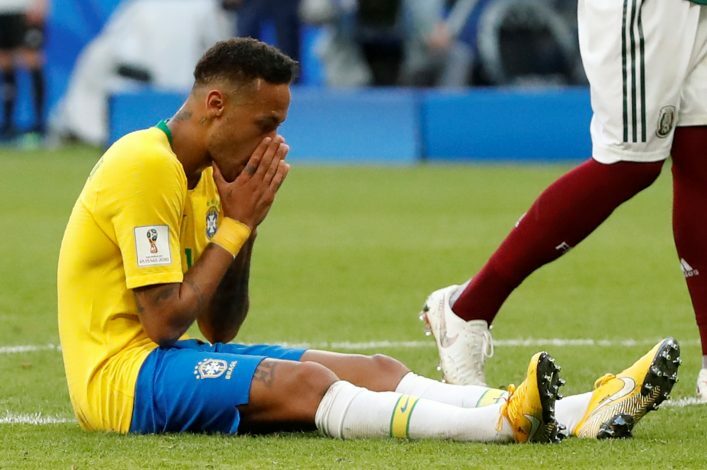 Neymar has been the centre of all attention when it has come to accusations of diving in the ongoing FIFA World Cup 2018. The Brazilian has been trolled on social media as well, with pundits laying claims that the Paris Saint-Germain player does this consistently to attract the attention of the referee. The World Cup campaign in Russia has seen Neymar do the same almost every match. With the former Barcelona star receiving a lot of criticism lately, Manchester United manager Jose Mourinho has claimed that it is not just Neymar, but many other players who are doing the same. Diving in football to win fouls and penalties has become a common scenario, with the slightest of touches seeing a player fall down easily. And Mourinho has claimed that every single team has lots of diving, and that, in turn puts a lot of pressure on referees. “People are focusing on Neymar, but if it was only Neymar, I’d be happy, but it’s not only Neymar,” Mourinho told Russia Today. The ex-Chelsea boss criticised England defender Harry Maguire for the same, by adding: “I was surprised to see central defenders like Harry Maguire, normally he is a very honest guy, diving in the attacking box, asking the referee for VAR. Mourinho’s comments highlight the issues modern day football is facing at the moment, and players need to be more responsible as ambassadors of their country and respective clubs.